In classical antiquity, the cornucopia /ˌkɔːrnjəˈkoʊpiə, ˌkɔːrnə-/ (from Latin cornu copiae), also called the horn of plenty, was a symbol of abundance and nourishment, commonly a large horn-shaped container overflowing with produce, flowers or nuts. 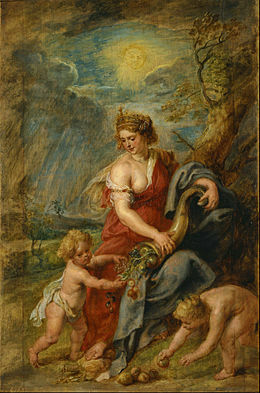 Wikimedia Commons has media related to Cornucopia. This page was last changed on 3 November 2018, at 20:57.